Dr. Hayes is the founder and medical director of the Vein Center of North Texas. Dr. Hayes grew up north of Bonham, Texas. He attended medical school at Texas Tech School of Medicine and completed his internship and residency in General Surgery at Carraway Medical Center in Birmingham, Alabama. 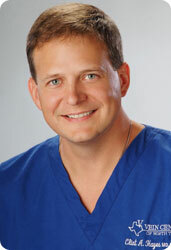 He began private practice at Texoma Medical Center in Denison, Texas in 1999. Dr. Hayes has performed hundreds of vein operations over the last eight years. The goal of Dr. Hayes and his staff is to offer you the highest quality in surgical procedures and care. This encompasses patient safety, confidentiality, and the latest surgical techniques in a congenial setting. He looks forward to consulting with you and discussing treatment options for a variety of surgical concerns.